In February of 2007, I, my one year old daughter, and my wife who was pregnant with our second child drove down to Springfield, IL. We believed that our young Senator would right the wrongs that had been committed by his predecessor, and set our country back on a proper course. We wanted to witness history as he announced his candidacy for the Presidency of the United States. That's me, wearing his shirt, when my wife gave birth to the boy that was in her body when he announced in February, 2007. You see, I'm not some Obama hater. Now, though, I am ashamed for my support of President Obama. I am stunned by the breadth and scope to which our constitution has been violated under his watch. And yet we still have hope because of Edward Snowden. Edward Snowden is a courageous patriot, who will no doubt go down in our nation's history as one of the most important defenders of freedom we have known. I have lost faith in congress, the President, and those who claim to protect us. 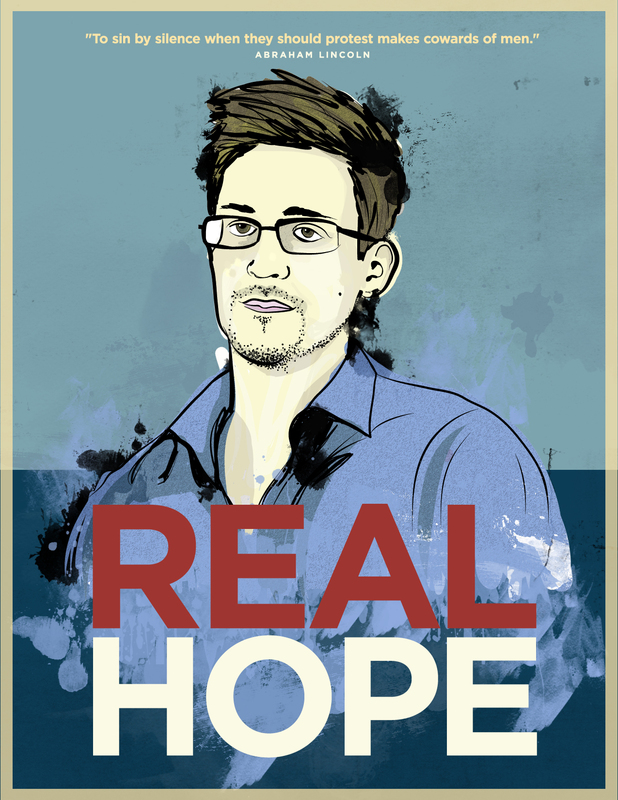 But I have hope because despite the sure harm that will come to him, Edward Snowden stood up and defended the ideals upon which our nation was founded. We owe him a debt we will likely never be able to repay. This work is licensed under a Creative Commons Attribution 3.0 Unported License. It may be altered and used for any purpose including commercial. Full size JPG file here, and PSD File here.